This type of spike barrier is driven by an electric motor installed in front of the main gate. Mostly, it is in rising status. When there is authorized vehicle to access, security people can use the remote control or manual switch to put the spike down. It can be integrated with all access control system or parking system. 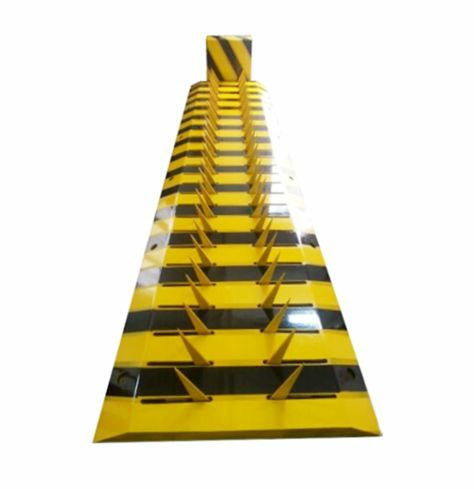 The Spiker Barrier is commonly used with the parking boom barrier and traffic light. When the green light on, the tire killer spike will close then the parking boom will rise up. When the red light is on, the parking boom will close and then the spike will rise up. This is to avoid the spike damage the vehicle tires. They can also be equipped with loop detector coil to close automatically, beam sensor for safety. We have our standard size but we can also customize based on clients requirement. The standard tyre killer is a one-way spike barrier. It can also be used for 2 ways. There will be two mechanisms and two motors, two control boxes. It controls bidirectional. As we are the manufacturer, we can also provide the OEM and ODM service. If you have your design drawing, welcome to inquire about the details. Your satisfaction is our pursuit.